Week 11 is here. We start with the Packers vs. the Seahawks tonight at 8:20 Eastern time, but the Monday night Chiefs-Rams game is the week 11 Super Bowl. 🙌 David Ryborz is at the top of our Week 10 leaderboard with 148.6 points. 🏆 Brian Hake is still in first place on our overall leaderboard with 808.4 points. 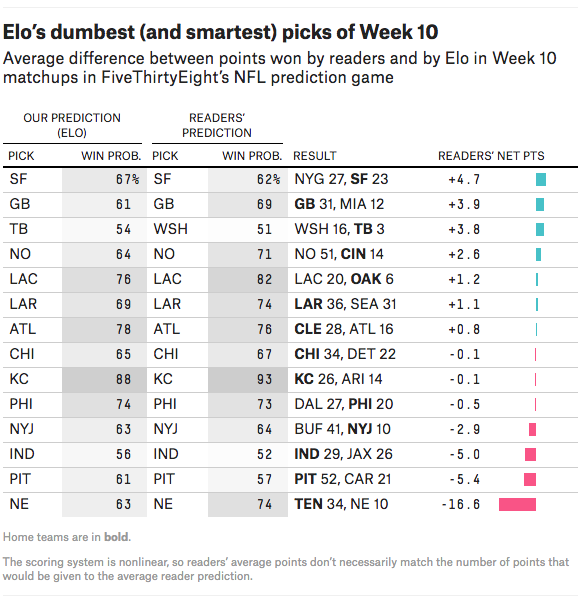 FiveThirtyEight’s Elo model is in 860th place with 456.3 points.